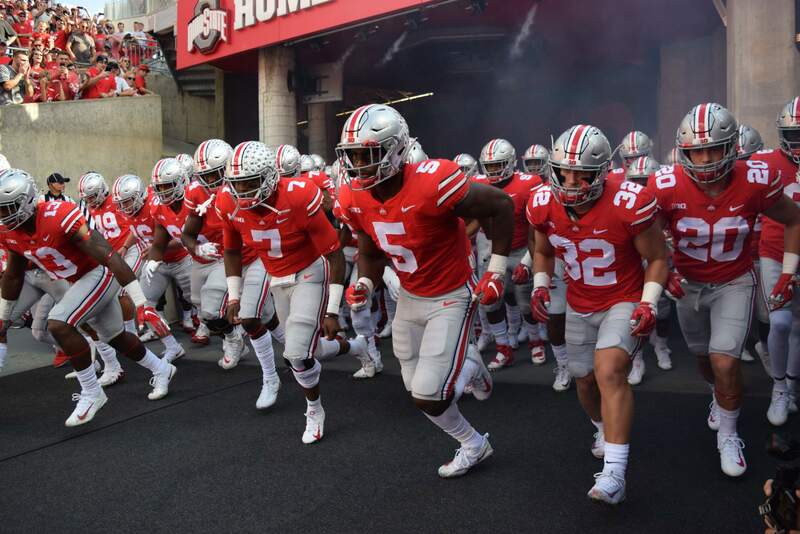 COLUMBUS — Ohio State improved to 6-0 overall and 3-0 in the Big Ten after a 49-26 win over Indiana (4-2, 1-2) Saturday at Ohio Stadium. Dwayne Haskins Jr. completed a school-record tying 33 of 44 passes while also tying an OSU single-game record with six touchdown passes. He also came up just three-yards shy of the single-game record for passing yards with 455. 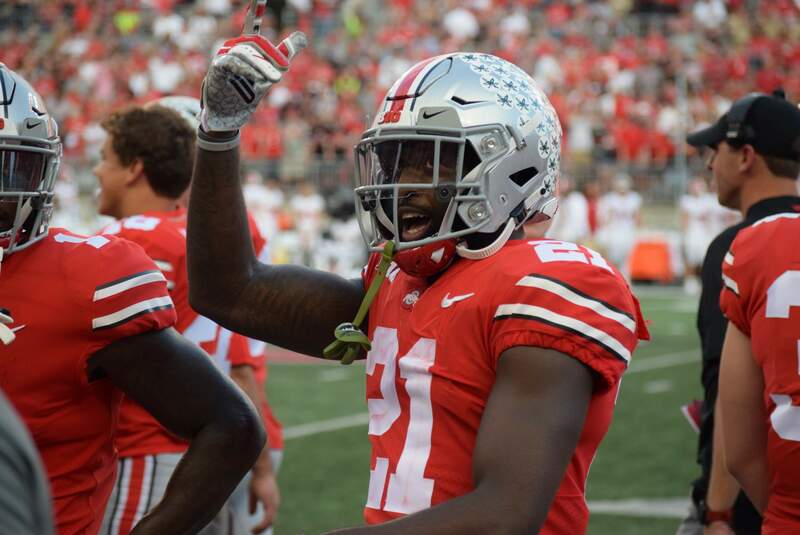 Parris Campbell caught a career-high nine passes for 142 yards and two scores. 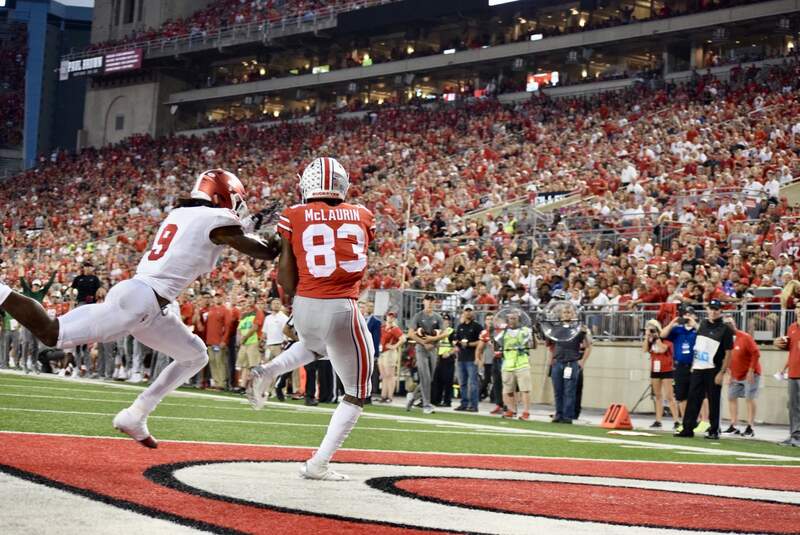 Terry McLaurin also had a pair of receiving touchdowns, his second coming on a 17-yarder early in the fourth quarter. 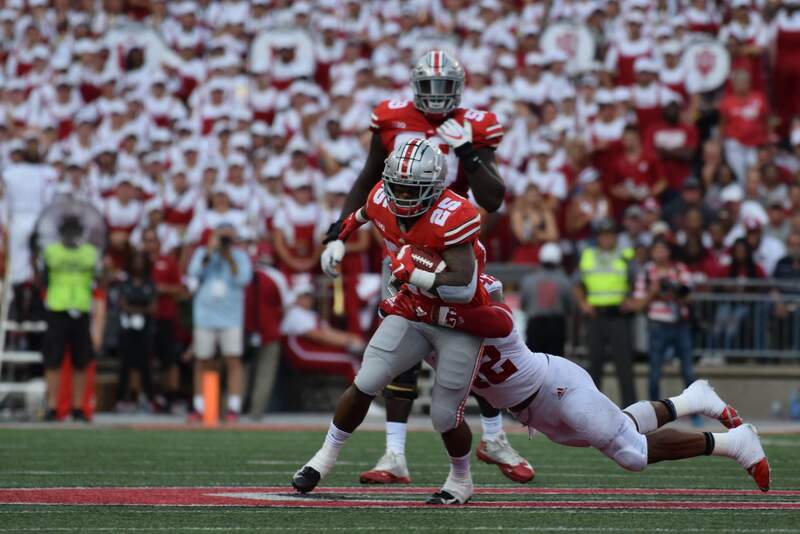 J.K. Dobbins and Mike Weber combined for 39 carries, 132 yards rushing and a touchdown (Dobbins). The Buckeyes had 609 yards in total offensive, marking the fifth time this season with 500 or more yards of offense. The Buckeyes return to action next Saturday at noon vs. Minnesota at Ohio Stadium. The game will be televised by either the Big Ten Network or FS1. 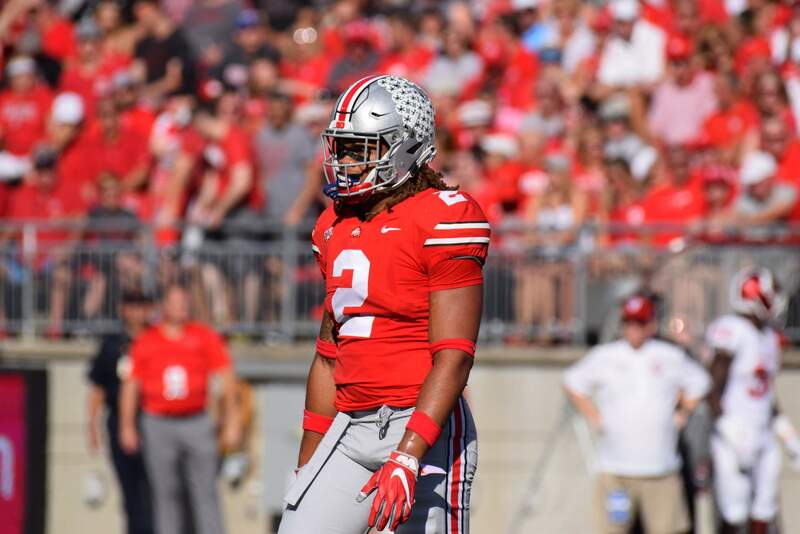 The Indiana Hoosiers took the opening drive to the Ohio State 14-yard line before an offensive pass interference penalty and another false start miscue pushed the Hoosiers back to the OSU 33. The Buckeyes stopped the Hoosier drive forcing a successful Indiana 37-yard field goal with 11:47 showing on the first quarter clock. The drive covered 56 yards on seven plays over 3:13. The Buckeyes fumbled on their opening possession giving the Hoosiers the ball back on the IU 38 leading 3-0. 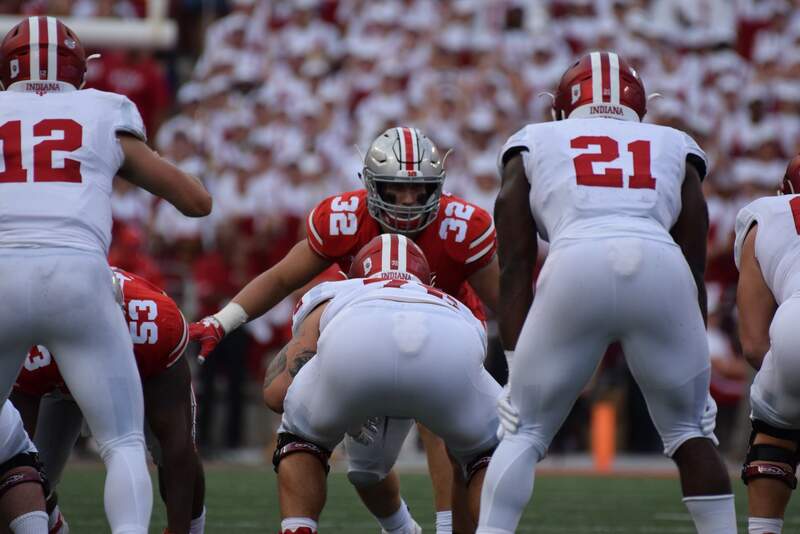 The Hoosiers again drove deep into Ohio State territory before the Buckeyes took over on downs after holding on a 4th down and 3 situation at its 29. 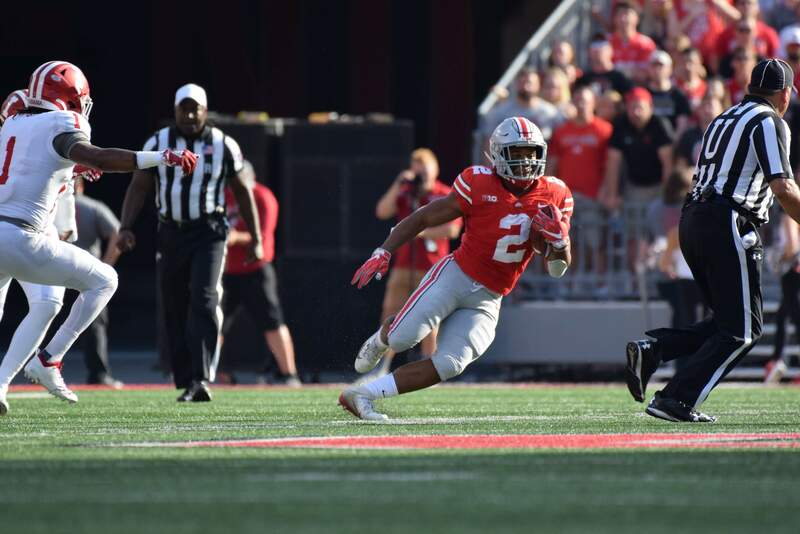 J.K. Dobbins got the Buckeyes on the board with a 1-yard TD run with 2:58 left in the quarter after the Buckeyes used nine plays to cover 71 yards over 3:06. Ohio State forced a Hoosier punt with under a minute to play in the quarter from the Indiana 40-yard line. 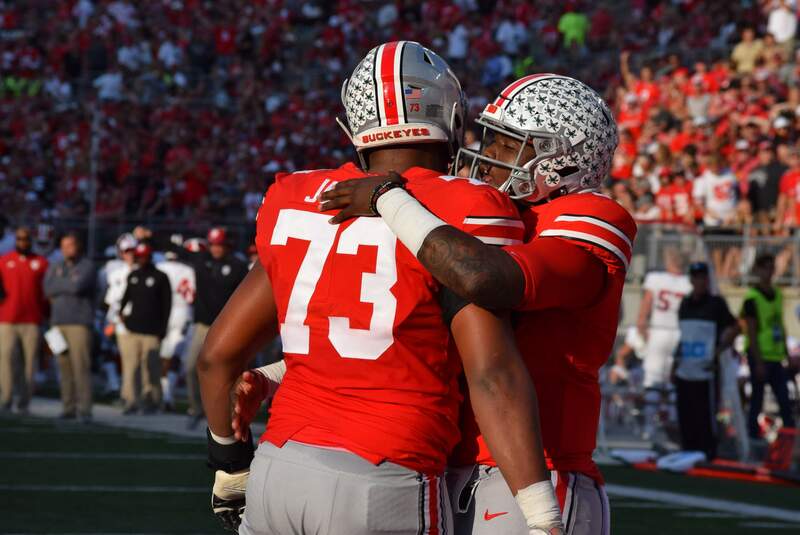 The Buckeyes took possession at the OSU 22 and drove to the OSU 33 before the end of the opening 15 minutes of play. 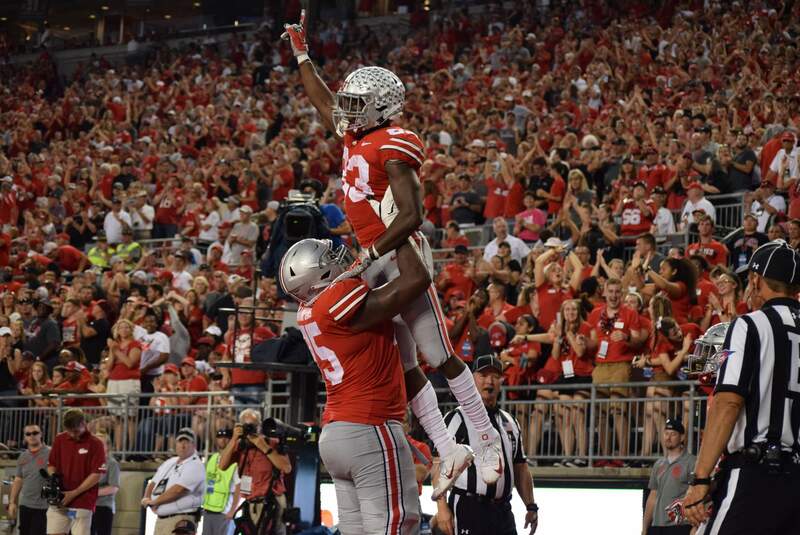 Johnnie Dixon scored Ohio State’s second TD of the afternoon on a 38-yard Dwayne Haskins, Jr. scoring toss giving the Buckeyes a 14-3 lead with 12:21 left in the first half. The drive, which spanned the end of the first quarter and start of the second, covered 78 yards on nine plays and 3:28 of game time. Indiana scored on its next possession on a 32-yard TD pass from Peyton Ramsey to Peyton Hendershot with 10:59 to play. The drive covered 75 yards on five plays over 1:22. Indiana cut the Ohio State lead to 14-10. The Hoosiers intercepted Haskins on Ohio State’s next possession at the IU 30 with 8:37 to go in the half. Indiana took advantage of the Ohio State turnover and scored on a 19-yard TD pass from Ramsey to Nick Westbrook to give Indiana a 17-14 lead with just over seven minutes left in the half. The scoring drive used 1:33 and covered 70 yards on six plays. 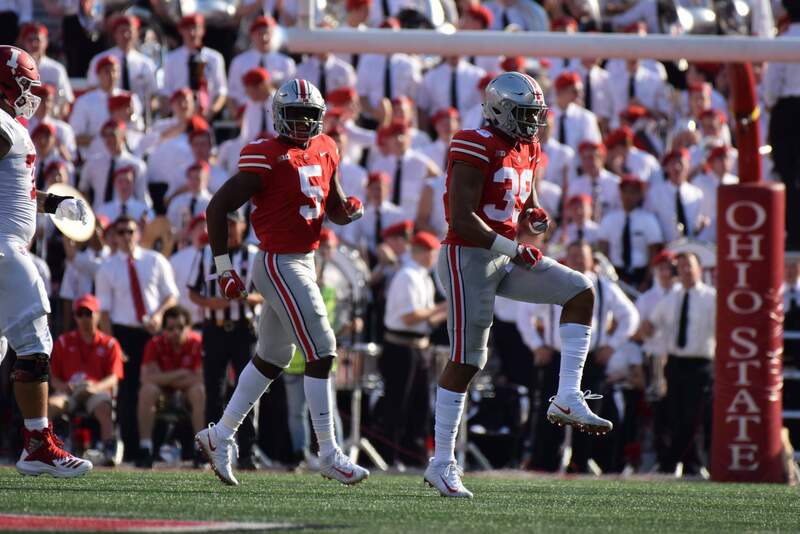 The Buckeyes wasted little time regaining the lead after a 75-yard, six-play drive that resulted in an 18-yard Haskins to Parris Campbell touchdown pass to give the Buckeyes the 21-17 advantage with 4:39 to go in the half. Ohio State’s Tuf Borland forced an Indiana fumbled on its next possession at the IU 32. 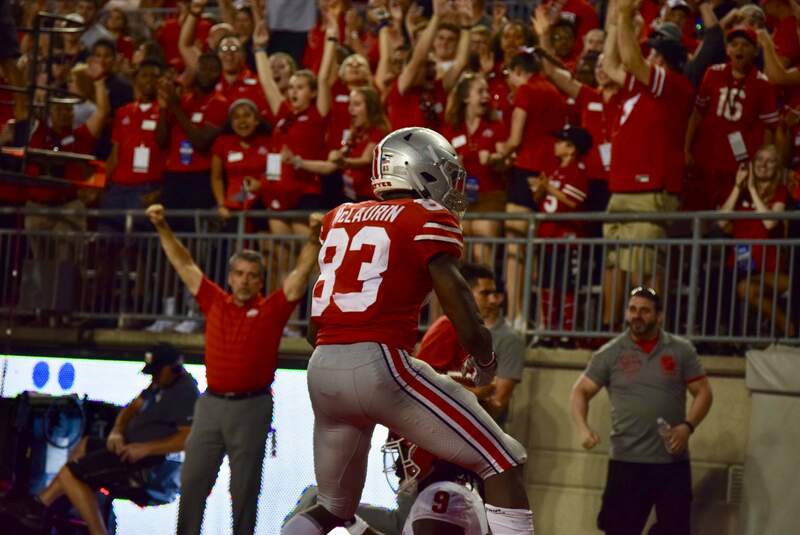 Ohio State recovered (Jordan Fuller) and scored six plays later on a Haskins to Terry McLaurin 7-yard scoring strike to give the Buckeyes a 28-17 lead. Indiana drove to the Ohio State 19 on its next possession but was forced to settle for a 37-yard field goal that closed the first half scoring for both teams. The teams entered their respective locker rooms with the Buckeyes leading 28-20. The Buckeyes scored quickly to open the second half on a 71-yard touchdown pass from Haskins to Campbell. Ohio State needed just 51 seconds and three plays to find the end zone to put the Buckeyes up 35-20. 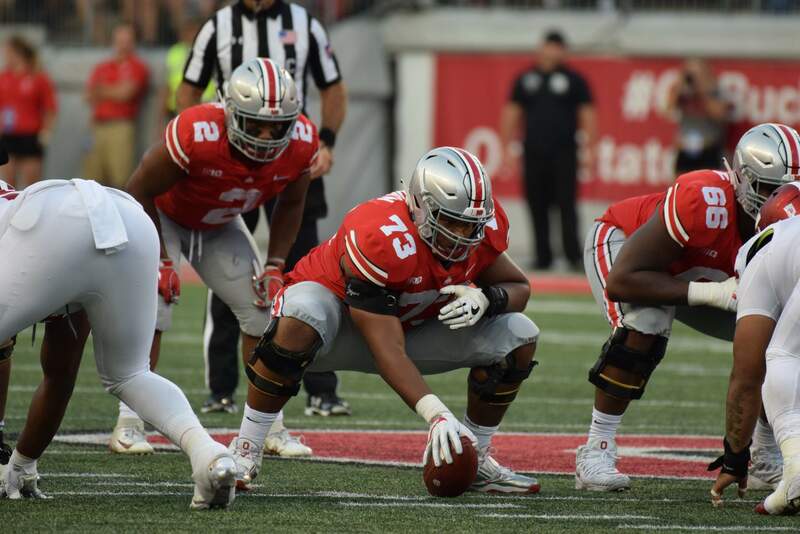 It was the 20th completion of the game for Haskins (24-32), marking the sixth-consecutive game in which he has completed 20 or more passes, an Ohio State record. Indiana was unable to move the ball on its opening possession of the second half. The Hoosiers were forced to punt and Ohio State took over on its 40. 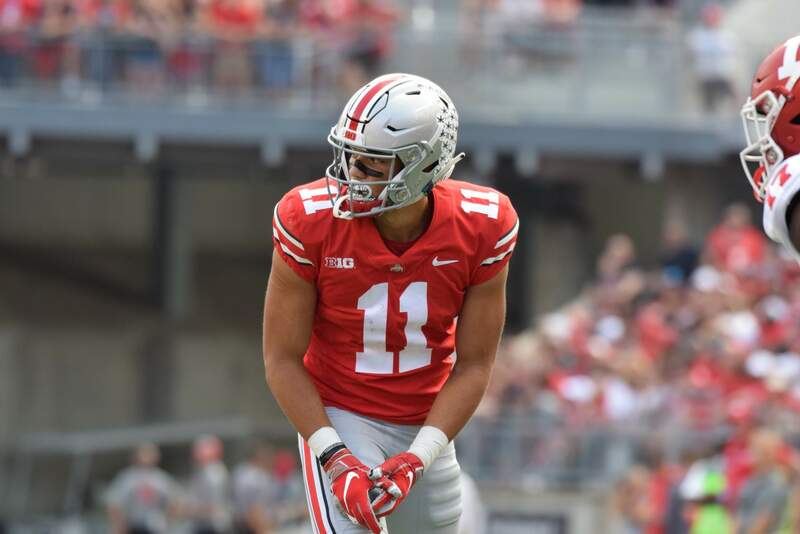 Ohio State also stalled on its next possession which resulted in a Drue Chrisman 52-yard punt. Indiana took over on its 22 after an 8-yard return. Indiana fumbled on its next possession. It was forced by Tyreke Smith and recovered by Dre’Mont Jones on the OSU 49. 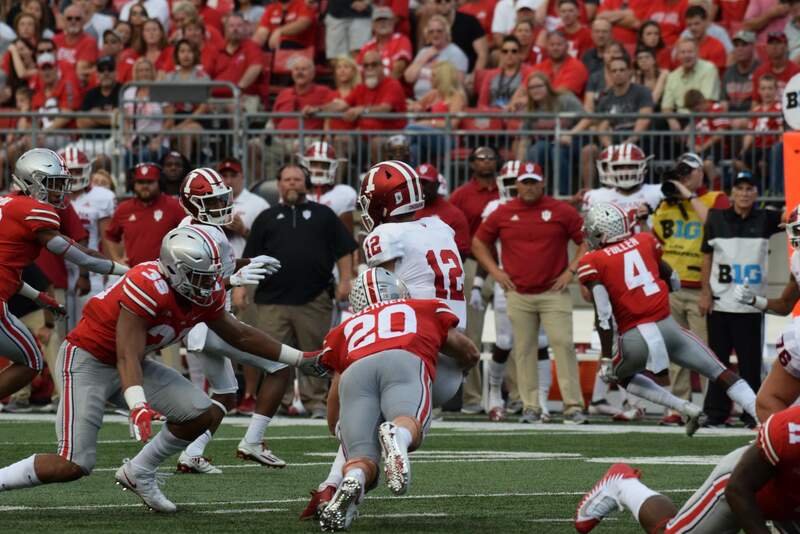 The Indiana defense stopped Ohio State’s next drive on downs and regained possession on its 42. The Hoosiers then drove 58 yards on eight plays to score on a 3-yard touchdown pass to cut Ohio State’s lead to 35-26 with 4:53 showing on the third quarter game clock. Indiana’s 2-point conversion attempt was intercepted by Ohio State’s Malik Harrison. The Hoosiers intercepted a Haskins pass at the 2:58 mark of the third quarter giving Indiana possession on the Ohio State 38. The Buckeye defense did not allow Indiana to gain a yard before an IU punt was downed at the Ohio State 4. Ohio State’s drive was stopped at its 2-yard line forcing a Chrisman punt, which traveled to the OSU 33. For the second-consecutive drive, the Ohio State defense did not allow a yard, this time forcing a 41-yard IU field goal attempt, which sailed wide right giving the Buckeyes possession on its 33 leading 35-26 with 17 seconds remaining in the third quarter. 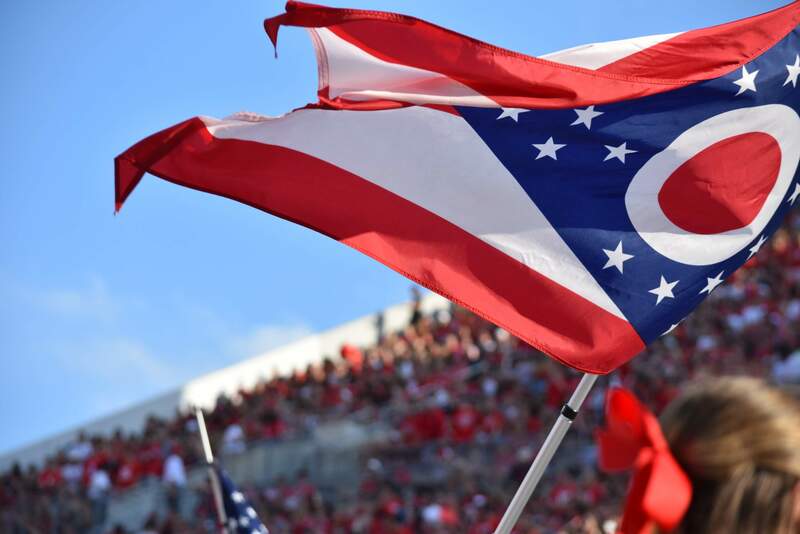 The Buckeyes completed a 10-play, 62-yard scoring drive at the start of the fourth quarter as Haskins hit McLaurin for their second TD connection of the day. After the PAT, Ohio State led 42-26 with 12:21 remaining. After an Indiana three-and-out, the Buckeyes again went 76 yards on 10 plays for another touchdown. Haskins school-record tying sixth touchdown pass of the day was made possible by a spectacular catch from Binjimin Victor in the back of the endzone.